The Mississippi State Department of Corrections is recruiting both male and female correctional officers. Applicants who possess strong values and integrity, and who enjoy a challenging job with people are welcome to apply through the DOC to complete the provided new hire training and start their career in any of Mississippi's state or private prisons, or in the county jail system. At this time, there are 2,895 officers working directly with approximately 20,742 sentenced offenders in state-run facilities such as Mississippi State Penitentiary, and the South Mississippi Correctional Institution as well as in private facilities such as Marshall County Correctional Facility, Tallahatchie County Correctional Facility, and Walnut Grove Correctional Facility. Due to the changing nature of the corrections industry where emphasis is increasingly placed on inmate need and reducing re-offending behaviours, the industry is poised to grow by a steady 5% upward trend until 2022. In addition to the creation of approximately 145 new roles over this time, recruitment will be ongoing to replace officers who change careers, are promoted, or who retire. Read more about these challenging job opportunities below. Mississippi Valley State University ranks first in our latest rankings with forty-three students completing programs in law enforcement administration and criminal justice out of a total 910 students from the 2012-2013 school year. Coahoma Community College ranks 2nd in our latest rankings with twenty students completing programs in criminal justice out of a total 690 graduates. Jackson State University ranks 3rd in our rankings with 70 students completing programs in criminal justice out of a total two thousand graduates from the 2012-2013 school year. University of Mississippi ranks 4th in our latest rankings with 148 students graduating from programs in law enforcement administration out of a total seven thousand graduates in the 2012-2013 school year. Itawamba Community College ranks fifth in our latest rankings with forty-six students completing programs in law enforcement administration and corrections out of a total two thousand graduates. Candidates who pass the assessment portion of the hiring process will be placed on a short list and contacted Mississippi's Human Resources department with further information regarding the final step in the hiring process. Conditional employment may be extended to these candidates - employment terms become finalized when candidates pass basic training at the state academy. The state Department of Corrections in Mississippi encourages citizens who are pursuing careers in state service through strong growth, namely as front-line correctional officers. 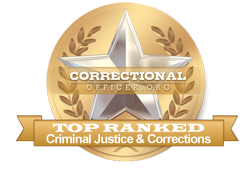 At this time, the median income for correctional officers throughout Mississippi is lower at $24,700 than the national median income at $39,800, however according to occupational data for the state of Mississippi, available at http://www.careerinfonet.org/occ_rep.asp?next=occ_rep&Level=&optstatus=011000000&jobfam=33&id=1&nodeid=2&soccode=333012&menuMode=&stfips=28&x=46&y=13 and published by CareerInfoNet.org state trends are predicted to experience a 21% growth curve from now until 2022 as compared to the national growth rate of 5%. This predicted growth pattern translates into 200 new openings and existing vacancies annually. The table below lists career information organized by the BLS for correctional officers in Mississippi. The table is sorted by total employment, with the largest metropolitan areas listed first.